Why Is Peak Oil Wrong? This week we learned that China has become the #1 oil importer in the world, surpassing the United States. A few weeks ago the Energy Information Agency (EIA) reported that the US is now the largest producer of oil in the world, surpassing Russia. And the port of Houston is now the biggest port in the United States, surpassing New York (think chemicals and energy-related materials). Those of us who pay attention to such things have known these events were going to happen for a long time, but even so, this is a big deal. Let's glance at a few charts to see if we can get a feel for the magnitude of the changes. 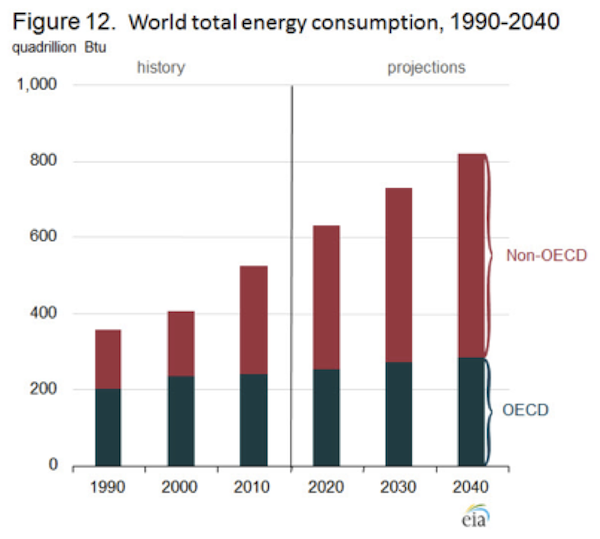 First let's look at total world energy consumption (charts from http://www.eia.gov/forecasts/ieo/world.cfm). Notice that the vast bulk of the growth is in the developing nations. More than 85% of the projected increase in global energy demand from 2010 to 2040 occurs among the nations outside the Organization for Economic Cooperation and Development (OECD), driven by strong economic growth and expanding populations. In contrast, OECD member countries are, for the most part, already more mature energy consumers, with slower anticipated economic growth and little or no anticipated population growth. Further, the developed nations are becoming much more energy-efficient, as we will see. Some people see this huge demand for energy as a problem. The large oil fields of the world are clearly "peaking out," and the concern, sometimes quite shrill, is that we will run short of energy in a few years. The biggest changes, of course, are happening in China and India. Since 1990, energy consumption in both countries as a share of total world energy use has increased significantly; together, they accounted for about 10% of total world energy consumption in 1990 and nearly 24% in 2010. From 2010 to 2040, their combined energy use more than doubles, and they account for 34% of projected total world energy consumption in 2040. 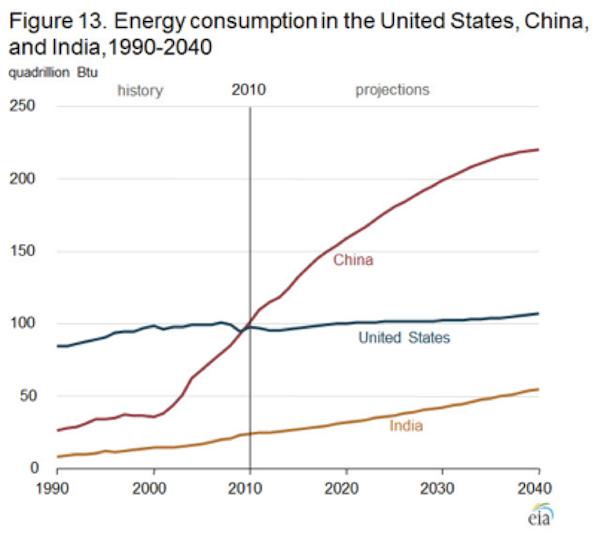 I am not sure that China will continue to grow along the same trajectory that it has, but I also feel that it's likely India will grow even faster than projected, so the endpoint may be the same. And while production from the old oil fields of the world is in fact beginning to slow, we are finding new oil and natural gas at an even more rapid pace than before. For instance, in my backyard, Texas crude oil production, at 2,525 thousand barrels per day (MBPD), was 31% higher year-over-year as of May. North Dakota crude oil production, at 810 MBPD, was 27% higher year-over-year. These two states are driving total US growth in oil production and have helped offset declining production in Alaska and the Gulf of Mexico. This growth is simply astounding when we look back over similar periods in history. Understand, the oil fields we are talking about have been in production for over 60 years. These are not new discoveries in the strictest sense, but a manifestation of the transformation that is occurring in energy-production technology. The Texas Railroad Commission released preliminary 2013 March and revised February Eagleford Shale oil production rates of 529.9 Mbbl/d and 511.4 Mbbl/d, respectively, representing a 77% increase from March 2012 production. February data was revised up from its prior report of 471.2 Mbbl/d. While the trend is correct, we believe actual production in the Eagleford is higher than what is being reported. Well-by-well production data obtained from our proprietary database has current oil production from February nearing 760 Mbbl/d, up 94% from year-over-year levels. Our preliminary March data is not fully updated, but recent month-over-month production has increased on average 5% a month. The growth of the Eagleford has been impressive and we think it will likely pass aggregate Bakken oil production in the near term. The most recent statistics from the North Dakota Oil and Gas commission have North Dakota production at ~782 Mbbl/d in March, up 35% from March 2012 levels but lagging the growth of the Eagleford on a relative basis. I've noted in previous letters that there may be as many as four distinct oil- and gas-producing zones layered on top of each other in North Dakota. So the Bakken could be four times as big as we think today. It now looks like similarly explosive growth is happening in the Permian Basin in Texas. 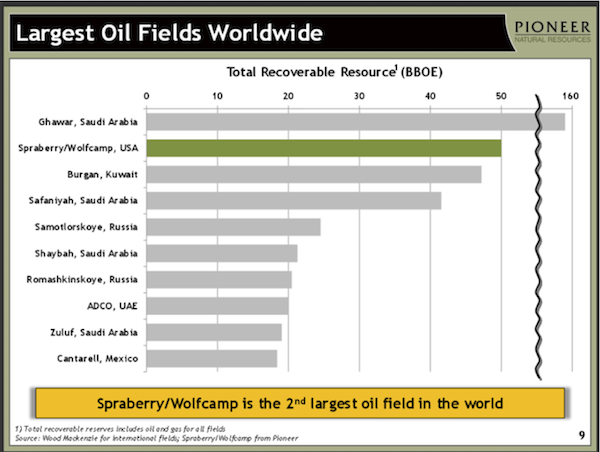 In a large rather "new" field called the Spraberry/Wolfcamp, the potential for finding oil is simply astounding. In fact, Pioneer Natural Resources is suggesting that it is the second biggest oilfield in the world (see table below). While we are finding more oil in the US, we are actually using less. 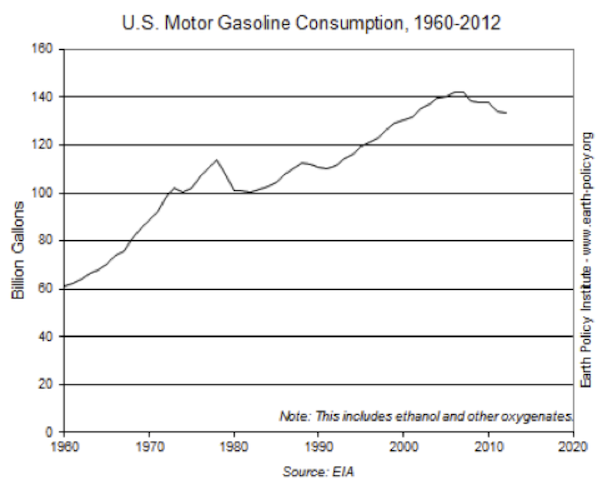 US motor-vehicle gasoline consumption peaked at 142 billion gallons in 2007. In each year since, American drivers have used less gasoline. In 2012, gas use came in at 134 billion gallons, down 6% off the high mark. This trend results from a combination of two factors: new vehicles get better gas mileage, and we seem to be driving less. This is not just a US story. 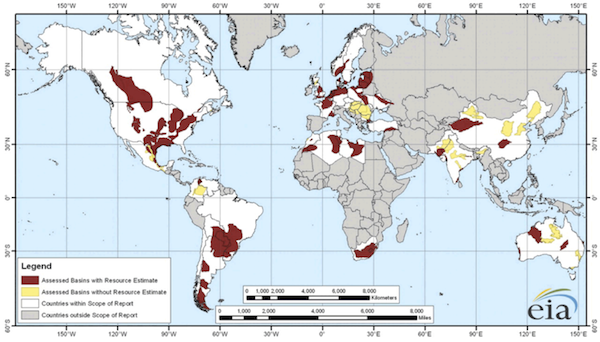 Below is a map of potential shale petroleum fields in a number of countries around the world. The countries in gray were not surveyed, although many of them are known to have massive energy resources. Almost none of the Middle East or the "-stans" or Russia or Africa were included in the survey. The amount of oil and gas recoverable given new technology is staggering. Why Was Peak Oil Wrong? 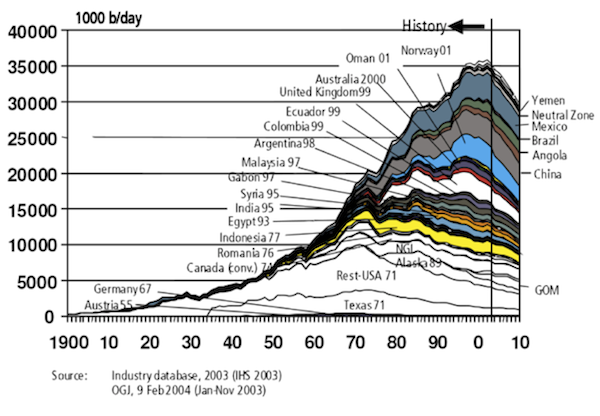 Let's quickly review the rationale of Peak Oil (source, Wikipedia). The Hubbert peak theory says that for any given geographical area, from an individual oil-producing region to the planet as a whole, the rate of petroleum production tends to follow a bell-shaped curve. This is one of the primary theories regarding Peak Oil. The theory is named after American geophysicist M. King Hubbert, who created a method of modeling the production curve given an assumed ultimate recovery volume. Choosing a particular production curve determines the point of maximum production, based on discovery rates, production rates, and cumulative production. Early in the curve (pre-peak), the production rate increases because of the discovery rate and the addition of infrastructure. Late in the curve (post-peak), production declines because of resource depletion. The Hubbert peak theory is based on the observation that the amount of oil under the ground in any region is finite; therefore the rate of discovery, which initially increases quickly, must reach a maximum and decline. In the US, oil extraction followed a Hubbert-like curve, with the peak in 1971 – until 2008, that is, when production began to increase sharply again. We were told back in the early part of the last decade there were no more really large fields to be found. Just for fun, let's look at a chart from 2004 that projected world oil production in 2010. Notice how Texas production begins to seriously erode, as does that of the rest of the US. Data like this was enough to convince investors to spend multiple billions of dollars building LNG terminals to bring natural gas into the United States. Now those same terminals are being repurposed to ship natural gas to the rest of the world. If you can pull it out of the ground for $3 and sell it for $16 – well, even I can do that arbitrage. New fields? No, not really. We have known the oil and gas was there for decades; we just couldn't get it up at a reasonable price. Now human ingenuity and new technology have made increased production possible. And while the United States may be the source of that technology, as the map on the previous page indicates, there are massive potential unconventional oil fields all over the world. Yes, these developments have significant geopolitical implications. And if the US generates a positive trade balance due to importing less oil and shipping more natural gas and refined oil products to the rest of the world, the US dollar could become remarkably strong and force all kinds of adjustments in global trade-settlement currencies. As I noted a few weeks ago, the Chinese renminbi could become a reserve trade currency not because the dollar becomes weak but because the dollar is so strong and additional trade currencies are needed. The peak oil enthusiasts had their facts absolutely right. But they missed a couple of important pieces of the puzzle: human ingenuity and drive coupled with the accelerating nature of transformational technology. If we were stuck with 1990s oil-production technology, then we would indeed see oil production peaking. Thankfully, we are not. A thousand incremental changes in technology, and oil that was uneconomic to extract now appears to be abundantly available. Ray Kurzweil told me a long time ago that when he was designing his cutting-edge technology products, he always had to assume that new chips and other components would be available in the future; and if he wanted to stay ahead, he had to design products to take advantage of the new chips. He was designing and creating products for which all the parts did not yet exist, but he simply had to assume they would be available in a few years. In my simple analogy, if you go duck hunting, you don't shoot where the duck is, you shoot where it is going to be. The technology of drilling is changing so rapidly that we can no longer assume linear growth in production. Thinking about the future now requires us to factor in transformational technological changes. And that means today's technology will be out of date in ten years. We will be able to get more oil out of the ground and do it for less cost as we keep improving our designs. Further, there is work going on all around us on developing entirely new sources of energy. The Japanese have been working for decades to unleash natural gas trapped in methane ice buried deep in the ocean. This is potentially more gas there than in the entirety of known reserves elsewhere in the world. A group in the US has figured out how turn carbon dioxide into methanol by a commercially reasonable process. Rather than burying all the excess carbon dioxide from energy plants in the ground, we will be able to turn it into a very useful fuel. There are dozens of such stories from all around the globe. The well-respected economics professor Robert J. Gordon recently published a paper called "Is US Economic Growth Over? Faltering Innovation Confronts the Six Headwinds." He outlines how the first three industrial revolutions created significant growth in GDP and advances in human lifestyles. He argues that no such revolution is on the horizon and that US growth in this century will be less than 1%. And while I agree that growth the rest of this decade in the US may be much less robust than normal, the main reason for the drop-off is poor governance, not a lack of technological progress. Gordon quite correctly documents the amazing impact that the steam engine, electricity, the automobile, running water, and computers had on our world. "Where are the next lifestyle changes that will boost GDP?" he ponders. And I agree that these were enormous changes, and perhaps we will not see another technology with the impact of electricity, although I am not completely convinced of that. But I think Gordon is missing the point of accelerating transformational change. We now have not just one or two industries that can make a huge impact but a hundred. Each one of those industries is undergoing rapid change. The change is mostly incremental, to be sure, but the direction is clear. And while none of the individual changes will have the impact electricity or the internal combustion engine had, the cumulative impact has the potential to be far greater. Gordon is measuring the wrong data. He is looking for the big change, the overwhelming technology, and he is simultaneously overlooking the accelerating and mutually reinforcing incremental change that is happening all around us. There were maybe a dozen scientists who understood the steam engine at the beginning of that revolution. Today, we routinely throw a thousand engineers at relatively trivial problems. Adding another few billion people into the midst of world commerce exponentially multiplies the potential for new innovation and incremental change. It is very likely that we will see a revolution in biotechnology in the next 10-15-20 years that will dramatically increase our healthspans, which is to say not just the age to which we live but the time during which we can enjoy those extra years in good health. Where does that improving healthspan show up in GDP statistics? That seems to me to be a major lifestyle improvement, and we will need new tools to analyze the effects. No one in 2034 will want to come back to the good old days of 2014, when today's healthcare will seem somewhat barbaric and outrageously expensive. Further, production of all types will become more efficient, requiring less labor to produce more goods and services. Many things will cost less but do more. To an economist this might look like a drop in the bucket of GDP, when it is actually a major societal good. Abundance at cheaper prices? Increased lifespans? What's not to like? Yes, this transformation has all sorts of implications for how we organize our lives. Accelerating change will mean constant adjustments. Some of us old dogs are going to have to be learning new tricks at an ever-increasing rate. I for one find that exhilarating. And yes, before we get to that Brave New World we have to get past a few things like budget deficits, unrealistic entitlement spending, massive quantitative easing, and Code Red central bank policies. I was riding around in a golf cart this week at the Barefoot Ranch with a young hedge fund manager. He runs a value fund and could wax enthusiastic about his investment ideas. But then he would ask me about my macroeconomic views, and I could see the frustration cloud his face. "I know this is bad, but I just wish we could get it all over with so I could just do my work without having to worry about what the government is going to do to me." He just wants to find great companies with solid business models that are priced attractively. And not have to worry whether the governments of the world are going to create another big crisis. He was wistful about the "good old days" where we had a normal business cycle with a recession every now and then. Perhaps I'm in such a positive mood today because I recently finished taping a video webinar with my good friends Patrick Cox and George Gilder and a few leading scientists, about some of the changes we can see coming in the near term. 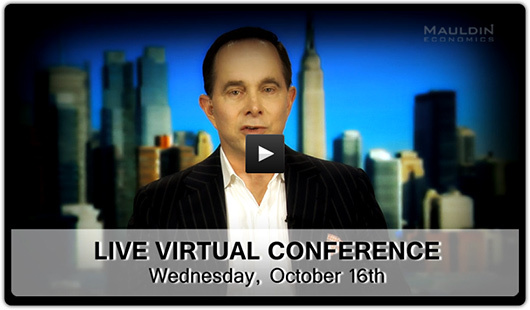 You can register to watch the video right here. Like my young hedge fund manager friend, I would so rather focus on the exciting transformations that are happening in our world, with all their positive implications. It is good to remind ourselves that there is life outside of government-created problems. The last three days at the Barefoot Ranch with Kyle Bass and his guests has been an amazing time. There were nonstop economic and investment discussions in a very relaxed setting with some of the sharpest minds gathered from around the world. Kyle and his team created a venue that is one-of-a-kind, in my experience. I'm still trying to digest what I learned. I had intended to write about it this week, but there was just simply too much, and I need to think about it all first. In 10 days I fly back to New York City, where I will join my co-author, Jonathan Tepper. We'll have various media engagements to help promote the new book. Strangely, my schedule after that allows me to be home for a few weeks, and hopefully I will be able to move into my new apartment during that time. Construction seems to be going painfully slowly, but I'm sure things will speed up towards the end of next week, after the flooring is in. I sure hope so. Living in my office or hotel rooms for the last eight months has been an experience that has helped me learn strategies for minimalist living, but I am ready for a little bit more living space. I drove back from Barefoot Ranch on Thursday afternoon, taking two good friends – my business partner Jon Sundt of Altegris Investments and Mark Yusko of Morgan Creek – to the airport to catch their flights home. Great conversation makes the drive go faster. After dropping them off, I went by to see my mother, who lives near the airport. She is 96 years old and bedridden, but up to this point has been mentally very sharp. "She's a little confused today," said my sister-in-law, who is taking care of her. And she was confused, with her dreams and memories impinging on her reality. From time to time she would be cognizant of the difference between the real and the unreal and try to think about that. This was the first time I had seen her like that, and it was a little difficult. I recalled my father's getting to that same place for the first time, slipping back and forth between the world that was and the world that is. I left in a contemplative mode, and upon arriving at my apartment realized I had left my briefcase back at the ranch. There was nothing to do but get in the car and drive there and back again. Left alone with my thoughts, with the car on cruise control, my own mind wandered back and forth between memories, the present, and thoughts about the future, coupled with competing emotions that came out of all that has transpired over the past week. Have a great week and spend more time with friends and family. And thanks for letting me into your own life with my weekly writings. I am grateful and humbled for the time you give me in a world where time seems to go ever faster. When the subarctic methane-trapping permafrost goes, and the Japanese liberate the frozen methane from ocean floors, the rate of temperature rise will truly accelerate again. The great fast-approaching tipping point is nigh, I fear. Too bad about those ‘externalities’, as the blindered economists like to call physical reality. Oct. 15, 2013, 6:02 a.m. This was a very encouraging article. However, I wonder if the chart of peak oil has an extra 0 on the scale on the left. For instance, the chart has the UK producing 20,000,000 barrels of oil/day in 1995, and Australia producing 22,000,000/day in 1995, and even Egypt producing 15,000,000/day in 1995. In 2010 total world oil production was 87,400,000 barrels/day. On the other hand Libya and Nigeria, major oil producers for decades, aren’t even on the chart at all. Oct. 15, 2013, 1:38 a.m. There is supposedly a huge shale oil field under coastal California from the San Francisco Bay area to San Diego. But it would have to be accessed by fracking, which is difficult to do in urban areas. Additionally there is major political opposition to fracking in CA over supposed environmental risks. On Sept. 23 the CA Legislature passed a law regulating fracking in CA., one that is conceded to be in need of re-writing. Oct. 14, 2013, 1:30 p.m.
Great article! I too embrace technology but there are a few problems presented with your facts. First, with advancements in healthcare, we hopefully will live much healthier and much longer, that’s great news. Question, in your words you say “we face an impossible entitlement debt”, how much burden will another 20 years to each our lives add to that debt? Secondly, it is a fact that we must reduce our entitlements in order to reduce our debt. While acknowledging the fact that technology must replace many jobs to make us competitive, how will we create enough jobs for both those working much later in life and all the youngsters looking for jobs? For my son and my future grandkids, I hope and pray your enthusiasm is warranted! Oct. 13, 2013, 9:06 a.m.
Great article John. I work at an oil refinery in California and apt of what you are writing about are topics that help put me at ease knowing that I may still have a job here in 10 years. My refinery is a small one in the Bay Area and what seems to be saving us at the moment is the fact that South and Central American countries are demanding more oil than their refineries can provide. As well as the fact that they seem to desire our cleaner CARB blends. I know that you tend to focus more on macro economic issues more often than microeconomic issues, but I was wondering what is your take on the California refining industry and the refining industry as a whole. We are squeezed on multiple ends at the moment by high crude oil prices, low gasoline prices at the pump, RIN’s, carbon cap-and-trade, ever increasing regulation, conversion of many commercial vehicles to natural gas, and many more elements. Also, refining capacity around many parts of the globe such as Asia, South and Central America are increasing. As a personal gripe, you mention increased automation and the fact that companies are doing more with less. As a worker I feel the increased pressure of this trend every day, as do millions of other workers across the country and across the world. With more people being forced out of work due to automation and other factors how are people ever going to afford living into their 80’s as many people do today or even into their 100’s as you claim will be possible in the somewhat near future? Oct. 13, 2013, 1:42 a.m. Enjoy today while you still can, Mr. Mauldin.